So you’ve lifted your truck. Now you need to consider how you and your passengers will get in and out of your vehicle. Stepping up into the cab can be a real pain, even if you have a stock grab-bar built in. The stock height of some heavier duty trucks can be a bit high for our passengers. Enter nerf bars and running boards. A nerf bar is a tubular device fitted to the side of a racecar, typically a single-seater that competes on asphalt or dirt oval tracks. Even now, running boards are not stock on all new trucks, but you can customize them depending on your options. Both nerf bars and running boards can improve the look and function of your truck. Nerf bars or running boards? Right away, you’ll see the most obvious difference between nerf bars and running boards is they have different step areas. The typical nerf bar is round with a flat area near the doors. You step on the flat area to enter the vehicle. The rest of the nerf bar is typically round and usually a slick surface that can be potentially hazardous. Typical running boards, however, run the full length of the cab or fully to the rear wheel well, and are flat for the entire length. Running boards can assist with access to the cab and to parts of your truck bed as well. Depending on what you haul and how often, this can be advantageous. Speaking of length, there are different lengths of both running boards and nerf bars. Some run the length of the cab, others run “wheel to wheel.” This length can make a huge difference in the utility of the steps. How you use your truck should be taken into consideration in either case. Presumably, one of the reasons you put a lift on your truck was to get more ground clearance. If you don’t want to compromise that, you may want to choose nerf bars over running boards. Nerf bars typically have a shorter length and a less dramatic effect on ground clearance. It may not be vital for someone who never plans to, but it’s something to consider when adding either one to your truck. Under your truck, you have a driveshaft, suspension, and other drivetrain parts. All of these affect your ground clearance. Skid plates can be installed to help prevent damage, but often, the bottom of the body doesn’t define true ground clearance. It can, however, have an effect when crawling over rocks and other obstacles, or when one side of the vehicle is higher than the other. Your effective ground clearance depends on the situation. If you have nerf bars and running boards sitting lower, you’ll be able to more easily access your truck but it may impact this type of ground clearance. Appearance is one of the most important factors for many people, and understandably so! There are a multitude of choices when it comes to color, shape and fit of nerf bars and running boards. Running boards can be stainless, chrome, black, and in some cases, can be painted to match the body color of your vehicle. 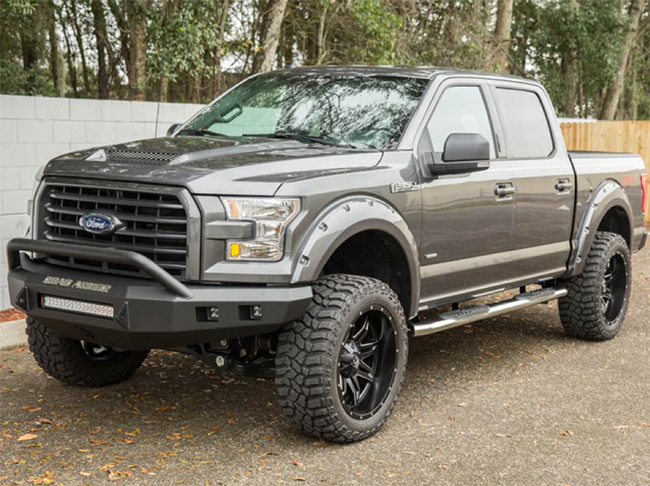 Whatever style you choose, running boards will dramatically change the look of your truck. You’ll want to get the cleanest look you can for the money. Nerf bars are pretty straightforward in their look. They’re usually rounded with step places and come in chrome, stainless, or sometimes anodized black aluminum. They have a pretty universal fit and come in the same length options as running boards. Their openness can have a sleeker look than full running boards. The final, and oftentimes most influential factor in your decision is your budget. Nerf bars tend to be simpler and less expensive than running boards. They cost less to install in most cases and usually come in bolt-on configurations. Generally speaking, nerf bars are a more universal and affordable option. Running boards can get complicated. Some are simple and bolt on easily or install with some simple drilling. While basic in construction (because they contain more actual metal) they’re usually more expensive than nerf bars. And if they have to be painted or customized in any way, that’s another expense. We suggest you compare costs for parts and installation before buying any running board or nerf bar. 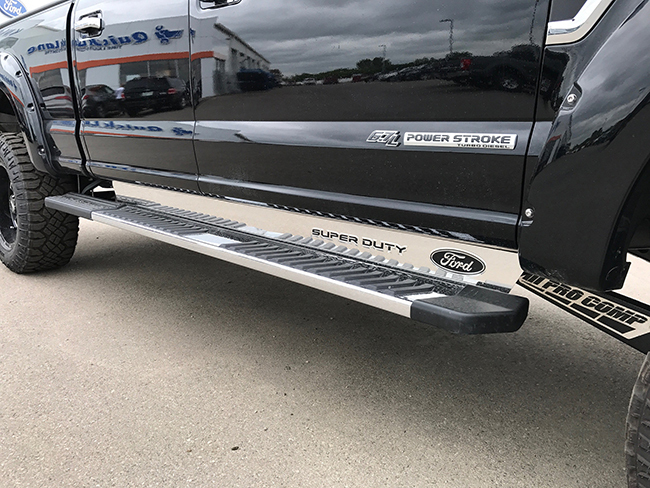 No matter which route you choose, a nerf bar or running board can help you and your passengers more easily access your truck. Neither is perfect for every situation so weigh your options, shop around and understand the impact they have on both appearance and function so you can make the right choice.